Kinshasa is the capital and by far the largest city in the Democratic Republic of Congo with an estimated population of around 8 million people. It is located in the southwest of the country along the shores of the Congo River. On the other side is the capital of the Republic of Congo, Brazzaville. Together they have nearly 10 million inhabitants, making it the largest conurbation after Lagos and Cairo in the whole of Africa. Kinshasa is not of particular interest for travellers, and functions more as a places for business men, rather than independent travellers. It can feel a little rough around the edges as well, especially after dawn. The bustling markets still are one of the highlights. Kinshasa is hot and humid year round, with temperatures usually around 30 °C during the day and 20 °C at night, with a few degrees difference between the hottest and coolest month. Rain falls evenly spread out, but the June to August period is a bit drier as well as a little less hot. N'Djili International Airport (FIH) functions as the main international airport in the country. Hewa Bora Airways is one of the largest airlines in the country, flying to and from Brussels, Douala, Johannesburg, Lagos and Lomé. Air France flies between Kinshasa and Paris. Other destinations with several airlines are Brussels, Harare, Brazzaville, Pointe-Noire, Addis Ababa, Nairobi, Casablanca and Luanda. In the country, Hewa Bora Airways flies between Kinshasa and Lubumbashi and Mbuji Mayi and Wimbi Dira Airways between Kinshasa and Gbadolite, Gemena, Goma, Isiro, Kananga, Kindu, Lubumbashi, Kalemie Mbandaka and Mbuji-Mayi. Compagnie Africaine d'Aviation has an extensive network between Kinshasa and Basankusu, Bumba, Goma, Kalemie, Kananga, Kikwit, Kisangani, Lisala, Lodja, Lubumbashi, Mbandaka, Mbuji-Mayi and Tshikapa. The railroad of Congo once covered the entire country during colonial times, but has fallen in to heavy disuse. While there is a central train station in Kinshasa, train service is erratic at best and does not run to many destinations for tourists. Tickets are usually only able to be bought the day of travel shortly before the train arrives and can prove to be difficult to get. Apart from the road Matadi to Kinshasa a car is no means for overland travel. You might be successful with a 4x4 in the upper northern region (Bangassou - Nia Nia - Isiro) and maybe the axis Kinshasa - Lumumbashi. All other towns are accessible only by air transport or boat. 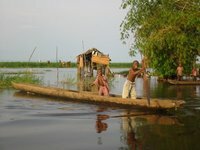 There are regular ferry services across the Congo River to Brazzaville. Officially there is a city bus and it has been bolstered recently by some older buses from Belgium being gifted to Kinshasa to improve the routes. This system pales in comparison to the "taxi" system that has risen organically to serve the needs of the people of Kinshasa. Essentially, these taxis are small buses. They run set routes between embarkation points that are the "stops". The cost between these various points is usually around 350 Francs. If one's destination is through multiple points, different taxis will need to be boarded to complete the route, making the system take a good deal of time during busy traffic hours. People waiting at the stops will move their hands in a variety of gestures to signal which direction they are going. A taxi will then stop and pick up someone if they are going in the same direction and have space in the taxi. This system works well for the locals. For visitors and foreigners, it can be quite difficult as one needs to know the hand signs, have knowledge of the routes, be ready to sit in cramped, hot vehicles with many other people, and deal with the potential dangers of these vehicles as many are barely road-worthy. Traveling through this manner absolutely requires local help for those unfamiliar with the system. One will also have to speak French or Lingala as the drivers do not speak English. There are also traditional taxis for hire. They are available for single runs or can be hired by the day. This can be a tricky business and should be handled with care (especially at the airport) as there are those will take people to remote locations and rob them. Again, help from a local is best or using drivers that others in the area have past experience with and trust. Rates for these taxis vary widely and if one does not appear to be of African descent, there will also be an automatic premium added. Lots of restaurants for 'expats' exist, where you can pay in dollars but it is very expensive. Don't be surprised to pay up to $20 for a pizza (and $40 at the hotel for one). Al Dar, near the hotel Memling, is a Lebanese restaurant in the centre of town. A shwarma sandwich runs about $3, and they have taboule, hummus and desserts as well. Many cheap roadside stalls exist, primarily outside of downtown's Gombe. Turbo King is a darker beer, regular lagers are Primus (which some feel is the best local beer, brewed by the local Heineken brewery) and Skol. European Mutzig comes in smaller bottles! A bit more expensive, and slightly harder to find as it is brewed in Lubumbashi by Simba Breweries, is Tembo, a tasty amber ale preferred by locals and expats alike. Tembo garners the highest ranking for a DRC beer on ratebeer.com. Lots of expensive French and South African wine available in restaurants and supermarkets. Portuguese plonk goes for as low as $3 a bottle at grocery stores catering to expats (Peloustore, Express, etc.). Kinshasa becomes alive most nights when residents head to Matonge, a place filled with dancing bars, restaurants and night clubs. Lately Bandal and Bonmarche are the more popular "quartiers" to visit the local bars and "discotheques". Go to a local nightclub and learn how to dance Congolese rhythms. Accommodation in Kinshasa can be very expensive. A consequence of the past problems mean that many organisations only recognise two hotels as having international standards. So the Memling and the Grand have a virtual monopoly. Prices of these two can be in excess of $300 per night plus breakfast. We have a comprehensive list of accommodation in Kinshasa searchable right here on Travellerspoint. You can use our map to quickly compare budget, mid-range or top of the range accommodation in Kinshasa and areas nearby. This is version 13. Last edited at 3:17 on Aug 2, 17 by sleepBot. 16 articles link to this page.